Lewisville Laser & Aesthetics is your headquarters for gorgeous, full brows and lashes! We have a wide array of products and services designed to give terrific results for a lush, natural look. The Real Brows method is an innovative new technique designed for drawing ultra-thin 3D hair strokes about 1 mm under the skin’s surface, using a specially designed tool and all-natural pigment. The Real Brows method will fill in sparse brows or create a new brow. How long will the treatment results last? Real Brows can last up to two years. To maintain Real Brows, touch up treatments are recommended every 9 months. Numbing cream will be applied to the brows prior to treatment. Once the first pass of 3D hairs have been completed, we will apply a liquid numbing solution to ensure you are comfortable. Your eyebrows will appear darker but plan to see 30-40% of the color fade. The excess color could remain on the skin for one week. It’s possible that your eyebrows could appear slightly red after treatment. The brows will begin to heal and you will feel a light crusting in the treated area. Do not pick! How will I know what brow look is best for me?? Choosing your brow shape will be dependent on your face shape. We will create a look that is just for you. Your eyebrow color will be custom blended to ensure accuracy. An aftercare sheet will be given to you at each appointment. 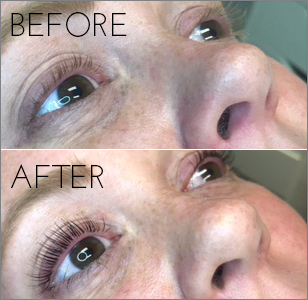 Our team at Lewisville Laser is crazy about Lash Lift, and you will be too when you see the results! Lash Lift is a procedure that curls, lifts, and tints lashes, with results lasting for 6-8 weeks. In just 45 minutes one of our licensed aestheticians will have you ready to go bare-lashed with confidence! Our Elleebana lifting solution is made specifically for delicate eyelash hairs. You’ll get the impact of an eyelash curler, but without the hassles and the pinching. Your aesthetician will also apply a vegetable-based dye to darken lashes for a thicker, fuller appearance. If you’re looking to really boost your own lashes, don’t forget the Latisse! Latisse is the first FDA-approved product designed to grow longer, fuller lashes. And you’ll see results as soon as four weeks after beginning application.